From the VP: NAPLAN: You have been heard! Three key ingredients for a successful campaign are anger, hope and action. These have been well and truly on display in our ongoing NAPLAN campaign. QTU members angry at having been fobbed off by successive governments when raising genuine and heartfelt concerns about NAPLAN and MySchool envisaged a better situation, one where NAPLAN is reviewed, reined in or replaced, and in May, teachers and school leaders in 96 schools took action and banned the implementation of NAPLAN Online. While we have won the reviews we were seeking, the campaign to address the impact of NAPLAN in our schools and classrooms continues, and to that end, another step in our campaign has been to gather the anger and hopes of members via a large survey of QTU membership. 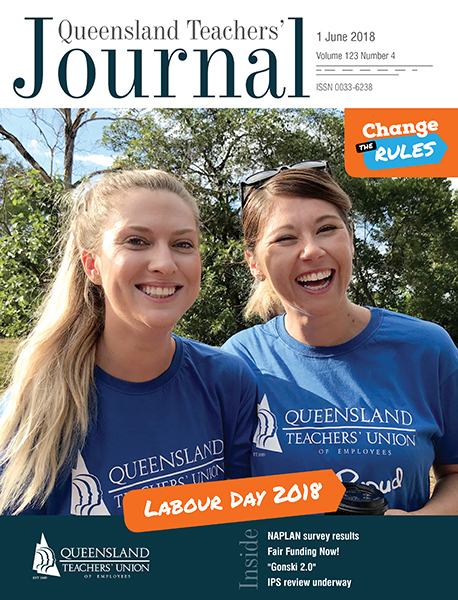 Thousands of QTU members recently took time out from their busy lives to complete the QTU’s member survey regarding NAPLAN (see page 13). The high level of participation reflects the strength of feeling among members. However, the survey results delivered more than just statistics in response to multiple choice questions. The survey allowed for participants to share their frustrations. Thousands of you took that opportunity. You have been heard. Our campaign to review, rethink and replace NAPLAN will continue.